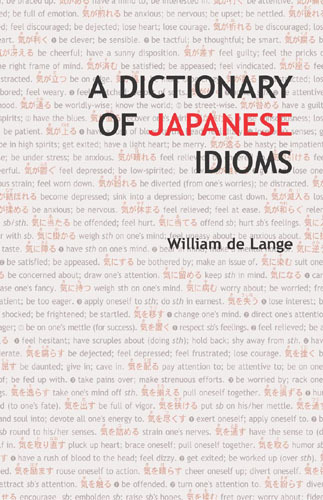 This dictionary offers the most comprehensive compilation and English translation of those idiomatic expressions that so enrich the Japanese language but fail to find their way into conventional dictionaries. It presents more than 6000 idiomatic phrases under 1000 main entries, including several thousands of idioms never presented and explained in English before. Multiple sample sentences are given for each entry, and furigana allows even beginning students to pronounce correctly and to use the expressions immediately. A thumb index and two-color printing, with all kanji and kana in red, make entries exceptionally easy to access. William de Lange studied Japanese language and culture at the University of Leiden and at Waseda University in Japan. For the past ten years he has been active as a translator and interpreter in a variety of capacities in the Netherlands, Germany, and Japan.